We have built lifelong relationships with our patients at Contact Lens Associates by providing professional, customized vision care in a comfortable and friendly environment. Our "patient focused perspective" drives us to provide impeccable service and products to meet your individual eye care needs. Dr. Barrett, Dr. Baumstark, and Dr. Seader have over 70 years combined experience. The doctors will check the health of your eyes with a comprehensive eye exam, as well as provide you with the best options in eye glasses and contact lenses to meet your individual vision needs. We will coach you on the most effective ways to protect the health of your eyes, and should you have an eye emergency or infection, we will get you in to see a doctor right away. Our eye doctors are members of the American Optometric Association - (AOA) and the New Mexico Optometric Association - (NMOA). They are trained and certified to perform pre and post operative lasik exams, as well as surgical co-management such as cataract surgery. The OCT allows your doctor to see a cross section of a patient's retina. The retina is made up of ten layers and each tells us a story about the general health of the internal portion of the eye. Doctors use this technology to diagnose and monitor conditions such as Glaucoma, Diabetic Retinopathy and Macular Degeneration. The OCT is also useful in diagnosing injuries to the back of the eye including: Vitreal Detachments, Retinal Detachments and injuries to the optic nerve. A visual field is used to detect impaired vision in one or all quadrants of a patient's field of vision. This technology is used to monitor conditions such as Glaucoma and Macular Degeneration. 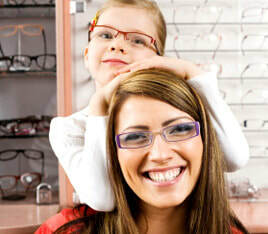 Our opticians are certified by the American Board of Opticians (ABO) and between them have over 50 years experience fitting and adjusting glasses. They are highly qualified, not just in customizing your lenses, but also in helping you choose a frame that compliments your unique sense of style. Our frames are some of the most fashion forward you'll find in the area, and we hand pick frames from well known lines such as: Prada and Versace for the ladies, and Oakley, Nike and Harley Davidson for the men. We also carry some unique, boutique brands such as: Lafont and Maui Jim. Whether your tastes range from edgy and high end to conservative and value based, we have the fashion sense and experience to help you find the perfect pair of glasses. ​More and more patients are turning to contact lenses as a means to correct their vision. Our optometrists use a wide variety of different types of contact lenses including: soft lenses, rigid lenses, colored contact lenses and specialty custom lenses for patients with Keratoconus and those who have high amounts of astigmatism as well as post-surgical patients requiring contact lenses. Each contact lens fitting is designed to meet your individual vision needs, and your lifestyle. Your doctor will work with you to find a pair of contacts to give you optimal comfort and vision. Our eye doctors are trained and certified to conduct both pre and post exams for surgical procedures such as cataract surgery as well as lasik/refractive surgeries.